Heading for a destructive re-entry over the South Pacific with several tons of trash, Japan’s fifth HTV cargo craft departed the International Space Station on Monday after overcoming a last-minute snag in the lab’s robotics system. The space station’s 58-foot-long robotic arm disengaged the HTV supply ship from a docking port on the outpost’s Harmony module early Monday, then maneuvered the spacecraft to a departure point about 30 feet beneath the complex. Astronauts Kimiya Yui and Kjell Lindgren were gearing up to release the H-2 Transfer Vehicle at 1520 GMT (11:20 a.m. EDT), but mission control instructed the crew to stand down after receiving an error message on the station’s robotic arm. It was not immediately clear what caused the brake error message, but astronauts rebooted the robot arm’s work station in the windowed cupola module and released the 33-foot-long barrel-shaped cargo craft about 90 minutes later than planned at 1653 GMT (12:53 p.m. EDT). Yui was at the controls of the robotic arm to let go of the HTV, which is the fifth in a series of at least nine Japanese supply ships built to service the space station through 2020. The HTV logistics freighters are nicknamed Kounotori, which is Japanese for white stork. The HTV-5 spacecraft fired its thrusters in a series of departure burns to move away from the space station, setting up for three major rocket firings Tuesday to guide the spaceship toward a fiery re-entry over the South Pacific Ocean. The first de-orbit burn is set to begin around 1357 GMT (9:57 a.m. EDT) Tuesday, with re-entry expected around 2030 GMT (4:30 p.m. EDT). Any small fragments of the HTV that survive the scorching plunge through the atmosphere will fall in the remote uninhabited South Pacific between New Zealand and Chile. The spacecraft is coming back to Earth with several tons of trash, including three unpressurized experiment boxes at the end of their lives. 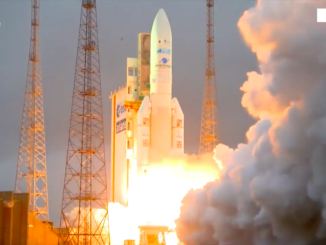 The packages from NASA, JAXA and the U.S. Air Force contain experiments that tested materials in space and observed the Earth’s ozone layer. HTV-5 launched Aug. 19 from the Tanegashima Space Center in Japan, and it reached the space station Aug. 24. The ship stayed at the complex for 35 days. 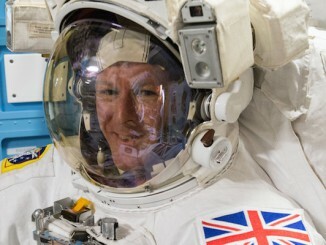 The mission delivered 9,500 pounds of supplies and experiments to the space station and its six-person crew. The experiments are devoted to studying how the human body changes in space, a prime objective of NASA astronaut Scott Kelly’s nearly one-year stay aboard the outpost. 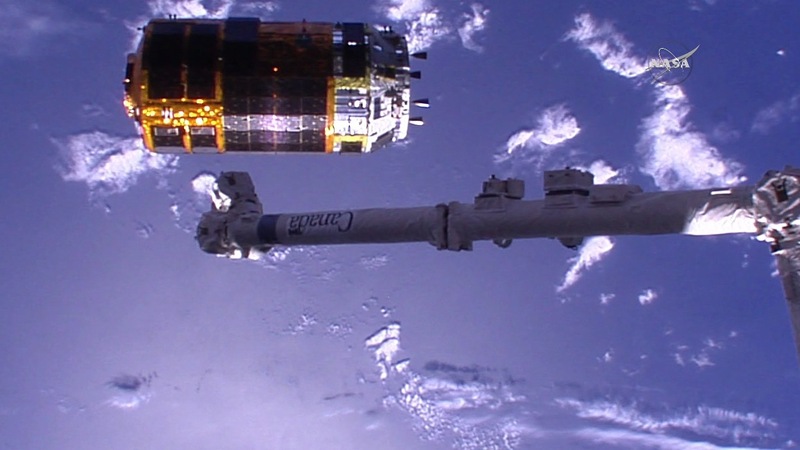 Other investigations delivered by the H-2 Transfer Vehicle include a cosmic ray telescope designed to probe exotic dark matter in the universe and a commercially-funded experiment devised to examine how Japanese spirits age in zero gravity. The HTV also carried up a new galley for the station astronauts to prepare meals. The next HTV mission is scheduled to launch in December 2016.